Developed as a sequel to Enchanted Meadow, PlayNGo’s Enchanted Crystals is a charming fantasy-themed slot that can make players rich through its re-spins, free spins, and bonus game. To play Enchanted Crystals for real money, players need to place bets of $0.20, $1.00, $2.00, $10.00, or $50.00. Once they have placed the bet they can afford, they have to hit the Spin button. If the reels display a winning combination of symbols when they come to a stop, players will get paid according to the game’s payout structure. Players should note that, as this is a slot with 243 ways to win, they cannot select the number of paylines they would like to play. To play this slot for real money, players have to bet at least $0.20. 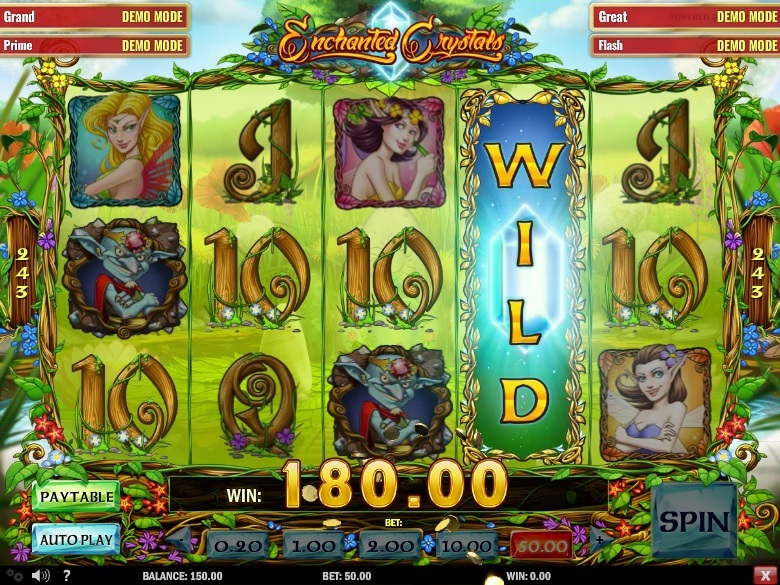 Enchanted Crystals is a fantasy-themed online video slot. Players are challenged to defeat the king of the goblins with the assistance of some good fairies and get back the enchanted crystals. Players who decide to play Enchanted Crystals can rest assured of an enjoyable and entertaining time. If players have played PlayNGo’s Enchanted Meadow, they will appreciate Enchanted Crystals all the more because it serves as a sequel to the former. The reels look bright and colorful as they are adorned with symbols of fairies, butterflies, goblins, and high-value cards and set against green meadows dotted with colorful flowers. Enchanted Crystals comes with re-spins, free spins, and a bonus game. The wild Enchanted Crystal symbol appears only on the second, third, and fourth reels. Whenever players land a wild symbol on a reel, it expands all over the reel. Players will then get a re-spin for each wild symbol. During the re-spins, the wild symbols remain frozen in position while the rest of the reels are re-spun to give players plenty of chances to win payouts. The Butterfly symbol serves as the scatter. If players land at least three Butterfly scatters on the reels, the free spins round gets activated. When this happens, players will receive 10 free games. However, they can re-activate as many as 50 free games while playing a free spin. When the free games are being played, as many as five butterflies can land on random symbols and convert them into wilds, enabling players to win up to 1,000 coins in this feature. Players need to land at least three Goblin symbols to unlock the Goblin King’s Chamber Bonus Game. This game challenges players to find the treasury of the king of goblins and select one of two treasure chests. If players find the Crystal, they will win a bonus prize of up to 500 coins. Although the slot does not have a flexible betting structure, players will not be able to resist its charming bonus features.